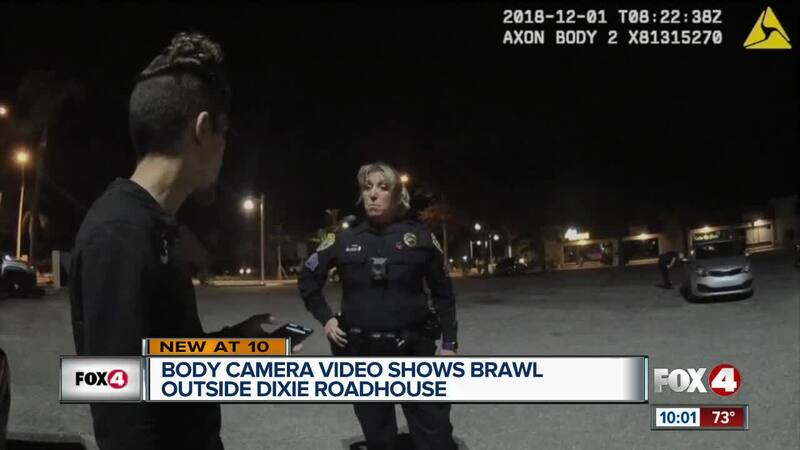 Four in Your Corner obtained police body cam video of the fight at Dixie Roadhouse that has many people talking. The video from the Cape Coral Police Department shows multiple incidents near the venue. CAPE CORAL, Fla. -- A popular hot spot in Cape Coral got their extended bar hours permit yanked after a huge brawl that spread out into the street. Now we're getting a look at what happened. The videos show DUI's, a passed-out male, and one showing how after security pushes people out of the club, a crowd lingers and police say a brawl with about 40 people takes place in and near the street. 13 police officers responded. This incident pushed the police department to say enough was enough. They suspended Dixie's extended bar hours, citing an immediate danger to the public's health, safety and welfare. We showed the video to retired Chief of Police Walter Zalisko. Here's what stood out to him: inevitably the size and capacity of the venue. "You're gonna have hundreds of drunks in there, compared to a smaller venue." Zalisko said the hours change is not a fix, and it will take time. But the city is on the right track. He says there's no easy solution. "It's a long-term problem. It's not gonna be a short-term problem, but they should definitely cut their hours back for now." The Cape Coral city council will hold a special meeting next Tuesday to discuss the emergency suspension of Dixie Roadhouse/Rockade extended hours permit, which is listed as an agenda item. Dixie Roadhouse says they're going to fight to get those hours back. It's important to note, we did speak to a woman who says she frequents Dixie once a week. She didn't want to talk on camera but says nothing's changed. She still enjoys going, but she makes sure she gets out early enough before things get "crazy". We reached out to Dixie Roadhouse and we are still awaiting comment.